Renting or buying a less than average sized home has many advantages. Smaller homes mean lowered mortgage bills as well as lower utility costs and decreased upkeep costs. A sleek and streamlined home is just right for a single person, couple or small family. While this kind of house can feel cozy and warm, it can also pose some challenges. You want to make the most of your home spaces. With a few thoughtful tricks, it’s easier than ever to create rooms that are thoughtful, inviting and make for very easy living. Storage is a must in any home. Proper storage allows people to keep their prized possessions in easy reach. Storage is particularly important for those who may not have as much interior space. This is where it pays to think creatively and make the most use of every single nook and cranny. Think about places where it’s possible to create storage out of non-traditional items. For example, stairs are useful and lovely. At the same time, they also take up a lot of space in home. Use the stairs to create additional storage space. Install pull out drawers in between the risers. This is an excellent way to create space to store items such as clothing, sewing supplies, electronics equipment and holiday decorations. Hang simple pegs across multiples spaces such as the back of your front door so you can stay organized. Other spaces can also be tapped into in your home in Cairns. Your garage makes an excellent place to store all of your outdoor equipment. This is where you can keep your bike, football helmet and all your rugby gear. Put shelving along the back of the garage and you’re good to go. When it comes to decorating a small home, it’s best to keep it simple. Ideally, all spaces should look clean and elegant as well as homey and welcoming. Start with the use of color. White and other, similar paint colors helps even the smallest spaces feel much larger and more open from every single angle. Paint most rooms white or similar shades such as grey and aqua in order to create a coherent, whole feel. It’s best to keep to a few shades rather than go from color to color as this will make each space appear to blend in with the next and make them both feel larger on the eyes. In addition, it’s also ideal to stick to a few well chosen pieces. Even smaller rooms can accommodate a large sofa. This has the effect of doing much to fill the entire space and make the most out of it. Other accessories are best kept to a minimum. Doing so will keep the focal point in view and allow each room to shine. Light is crucial in all interior home spaces. Natural light makes it easier to see things and relax. Use natural light to bring the light inside all the room’s homes. Consider installing a skylight to make it possible to light to come everywhere even from the ceiling. Use curtains sparingly as they can block off the room’s light. Sheers are a good choice that add mood without bulk. Mirrors can work wonders in any room. Mirrors help direct light to all corners of the room. A large mirror set over the mantlepiece can make the living room much brighter and full of welcome space. Look for mirrors that fit into your personal home style. Ornate mirrors with lots of intricate detail are a great way to bring in upscale style and create pleasingly curved lines. Minimalist mirrors fit in well with any type of home décor. Place them scattered corners across the home. Hung over an entrance, they can make it easy to tantalize visitors with an appealing vista even before they come inside. 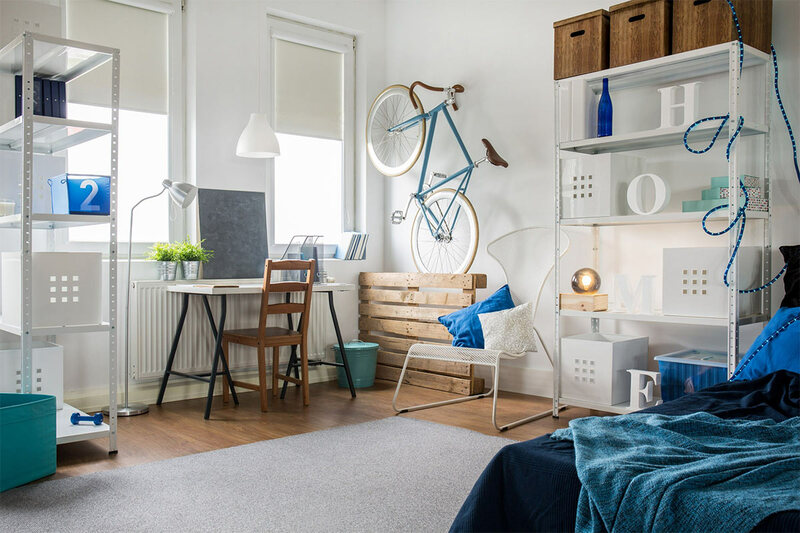 If you have small spaces, you need to make the most of your existing furnishings. One of the best ways to accomplish this goal is making every single piece in your home do double duty. For example, buy a coffee table with a pull out top. The top can serve as desk for your home office while the space underneath adds additional storage space. You can find space in other parts of your home. Put your bed in risers and use the space underneath to keep your makeup. Turn your living room into a guest bedroom. A pullout couch with a bed that pops up offers any unexpected guests room to relax. A Murphy bed pulls into a wall niche during the day and then rolls on the floor easily at night to give you another way to create a bedroom in any other room. Look to modern designers for help. As more people make due with smaller spaces, they’ve gotten more creative with contemporary solutions for the modern homeowner. Homeowners can take special advantage of the fact that they have access to the outdoors. Make your backyard, side yard and front yard part of your home’s interior spaces. Create a personal space under the veranda for tea and outdoor dinners. If you have a balcony from any bedroom, treat it like an extension of the bedroom. Place furnishings next to the eves and a cheerful umbrella to shade you from the morning sun as you eat weekend brunch. Turn each area of the yard into a room. For example, one area can be devoted to growing roses and other annuals. Another part of the yard can be ideal as a place to set aside for the kids. A play set with a wading pool makes a fine family retreat on a hot day. Make your outdoor rooms even more private with the use of fencing and plantings that make it feel like part of the rest of the home. You’ll have a great home that works both indoors and outside.